As you travel around Banderas Bay in Mexico, from just outside the curve of the northern tip all the way around to the southern edge, you can find a smorgasbord of beaches, each one different, and each one gorgeous in its own way. Banderas Bay is bounded on the north by Punta Mita and on the south by Cabo Corrientes, with the resort city of Puerto Vallarta just about in the centre. Within the blue curve of this Mexican coastline, each fold and turn hides sun-kissed beaches, some small and intimate, some wide and busy. There's a family beach, a surfing beach, a gay beach, a beach where you can buy fresh coconut pie – in short, a beach for every taste. With the town of Puerto Vallarta as your centre, a beach lover can choose a different stretch of sand each day and find a new slice of local Mexican life each time. Here's an even dozen – all worth a visit. With the peso having dropped even lower post-Trump, Mexico is a real bargain and with cold weather coming, it's the perfect time for a warm escape. Life can indeed be a beach. This is one of two "Beaches of the Dead" and I like to think of this one as the beach for philosophers. It is a quiet sandy space, protected from the larger waves by an outcropping. The sand stretches all the way up to a traditional graveyard, worth a visit all by itself. It's the perfect place to throw down a blanket, put on your sunscreen and contemplate the meaning of life and death. If you get bored, the surfing beach is just around the corner. These are a string of sophisticated beaches, with comfortable cushioned sofas and cabanas, a cool thatched beach shack serving drinks and burgers, and a long, wide smile of white fine sand. One section has craggy rocks and rough surf, but just around the edge of the cliffs, the water becomes calm. The drawback here is that you can only use these beaches if you are a guest of the hotel. But you can book a reservation for lunch or dinner in the surfside Bahia Restaurant and enjoy the spectacular ocean views. Be prepared to go through some tight security, though. This is where the President of Mexico plays golf, and where celebrities such as Gwyneth Paltrow own villas. Loafing around Banderas Bay at sunset provides a magnificent view. The name originated from the fishing dock where local boats used to offload their catches, but now the beach is a super place for surfers, particularly for beginners and longboarders. This is where you can try out your moves before you tackle some of the bigger waves such as those at Playa Lo de Marcos, outside the bay. Nothing dead about this beach. It's the epicentre of life in Puerto Vallarta and you can find almost everything here. The section near to the River Cuale is called Olas Altas, and in that part you can find, under the bridge, the local oyster vendors. There are often artists painting in the early mornings. Water sports abound, beachside cafés are numerous, mariachis will serenade you, vendors will sell you anything from sun hats to souvenirs and friendly ladies will give you a manicure, a tattoo or a massage while you recline under your umbrella. It's busy, family friendly and fun. Towards the end of Los Muertos Beach is a resort and beach café called the Blue Chairs, and an area of the oceanfront that is the gay beach. Though decidedly Catholic, Mexico is not judgmental about different ways of life, and Puerto Vallarta has long been a gay-friendly destination. This is the best place to enjoy the "Golden Hour," that soft time of the day, when everyone comes down to the beach to watch the sun go down, enjoy a cool cerveza and wait for the green flash. A more rugged beach, with tide pools and rocks, Conchas Chinas is ideal for children who want to paddle in the shallow pools and look for sea creatures. Drop in to the Lindo Mar Resort Restaurant right on the beach where you can get a simple lunch or enjoy a very reasonable dinner while you watch the sunset. Located south of the city, this is a long and wide white-sand beach where you can walk for long distances and wade in the calm waters. The sand is perfect for sandcastles. On weekends this is a busy place with local families and their children enjoying beach picnics. John Huston made this beach famous with his filming of the movie, The Night of the Iguana, but there is little left of the Hollywood glamour. It remains an attractive beach area, framed by the surrounding jungle and the Sierra Madre Mountains. There are a few small restaurants and on the north side, up the hill, is the Barcelo Resort. If you feel ambitious, you could do a half-hour hike to the Vallarta Zoo. The little town is the end of the road for the bus line and the last beach in this stretch that you can access by car. The restaurants on the beach are often very busy as this is the place where both visitors and locals come to catch the pangas (small fishing boats) out to other villages and beaches. You can enjoy fresh fish, grilled shrimp and tortillas while watching the boat action. Tiny and jewel-like, this pristine beach is pure pleasure to float around in. The sand beach is surrounded by cliffs, so it's quiet and private. Just five minutes by panga from Boca de Tomatlan, the beach is right beside one of the best restaurants in the area, the Ocean Grill. You have to reserve in advance to dine here but the food is excellent and the ocean views are magical. If you'd rather get some exercise, you can take a 40-minute and fairly aggressive hike to this cove. The beach at Yelapa lets you hike into the mountains to a waterfall or go horseback riding. And the star is Hidden Beach, on the Marieta Islands out in the middle of Banderas Bay, which ranked 10th on The Guardian's annual 50 Best Beaches in the World list. The islands are reachable by excursion boats or pangas, and it takes about two hours sailing time to reach them. They are a protected area, famous as a habitat for blue-footed boobies. You have to swim through a tunnel to visit Hidden Beach, but you emerge into a sun-filled pocket of blue water and white sand, totally surrounded by rock and invisible from the other side of the tunnel. Visitors are only allowed to stay for a brief time but just seeing this secret treasure is a thrill. And there's rum punch and entertainment on the return trip to the marina. Several major airlines run direct flights to Puerto Vallarta from major Canadian airports during the winter season, including Air Canada, Air Transat and WestJet. Several of the beaches are reachable on foot from the old town of Puerto Vallarta. Local buses can take you to the beaches outside of town, or you can rent a car. Some of the farther-placed beaches can be reached by panga from Boca de Tomatlan, or from the Los Muertos Pier. Boat excursions to the Marietas leave from the Marina. 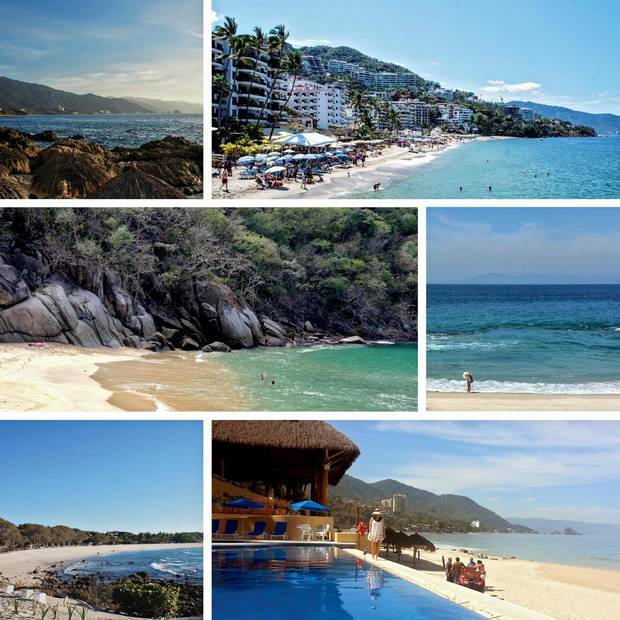 All are within a short distance of the city of Puerto Vallarta and make an easy day trip.